Below are a selection of railway station cachets. The earlier examples have quite regular shapes and then from 1934 many strangely shaped cachets began to appear. 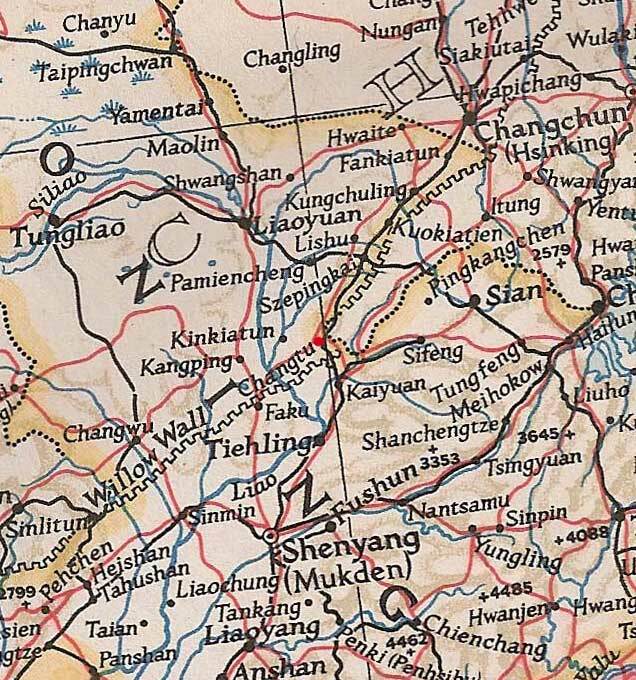 The shapes include buildings, animals, birds, city outlines, people, fruit and just about anything else that might be associated with a town or region. There are a huge number of different designs, possibly one for each station. 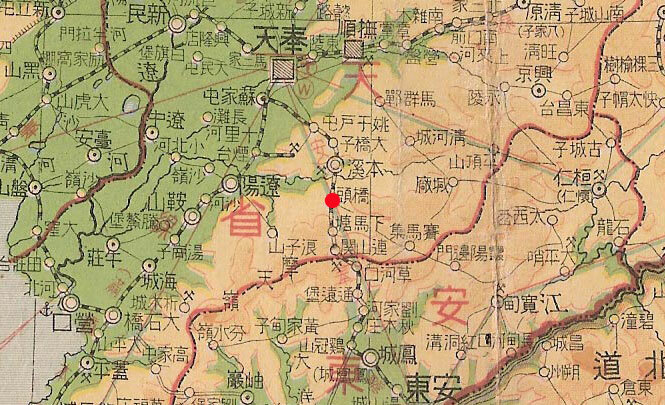 The place name is often followed by the character 驛 or 駅 (Eki) this is Japanese usage meaning station, in some instances the Chinese character 站 Zhan is used. In most instances the Cachets appear to use 昭和 Shōwa (Japanese) dating. These cachets were collected in special booklets throughout railway journeys. The cachets were available at stations for anyone to use, when the train stopped you simply got out and stamped your booklet. 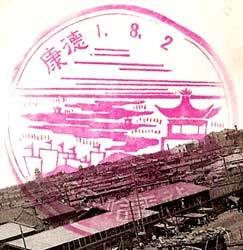 In addition to the railway cachets collectors added the date-stamps of hotels and tourist attractions making the booklet a complete record of the trip they had taken. 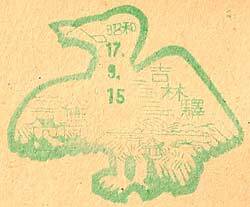 Most of the booklets I have seen have included Korea, North China and the KLT as part of the journey so the use of these hand-stamps seems to have been common in Japanese occupied China at this time. 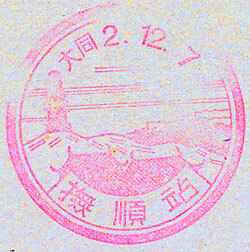 Railway Cachet - Dated 1st January 1932. This example was issued at 營口 Ying-k'ou station. 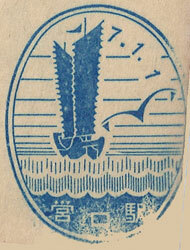 The image shows a lug sailed junk which is often used as an emblem of Yingkow with a seagull in the foreground. Size 38mm x 50mm. 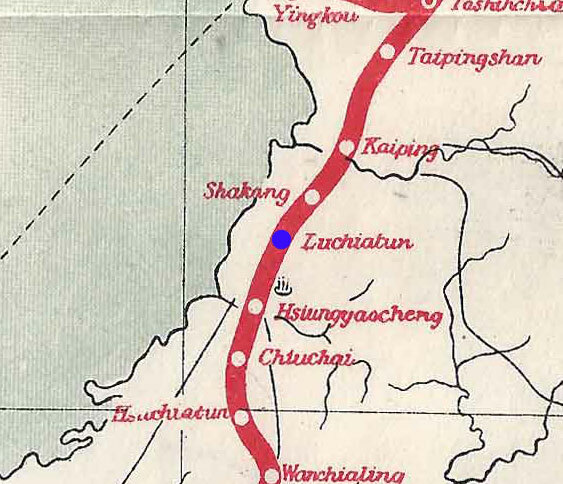 Known colours - Blue Railway Cachet - Dated 14th March 1932. This example was issued at 遼陽 Liao Yang Station. 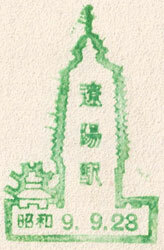 Design features - an outline of the white pagoda, city wall and a pavilion. Design Size 36mm x 46mm . Known colours - Blue. Railway Cachet - Dated 9th June 1932. 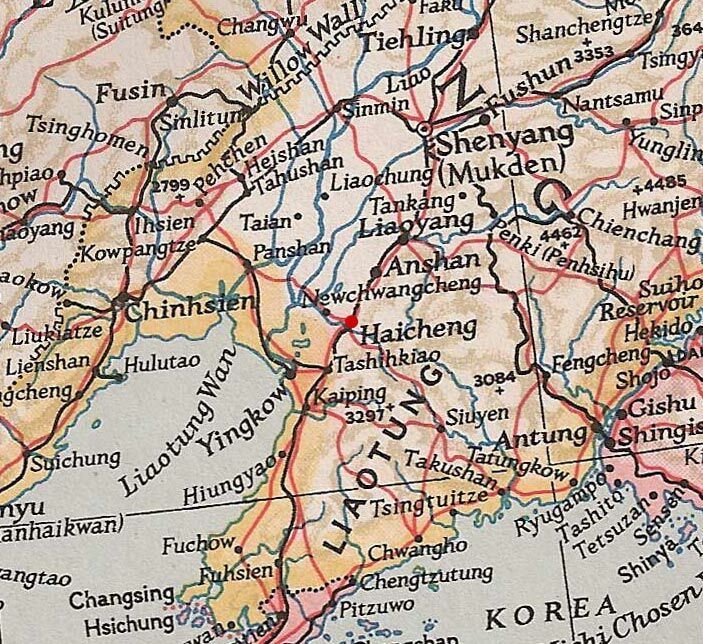 This example was issued at 四平街 Sze-ping-chieh station. 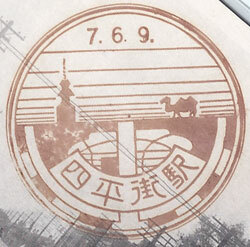 The image shows a camel and a monument with an art deco design below. Size 35mm dia. 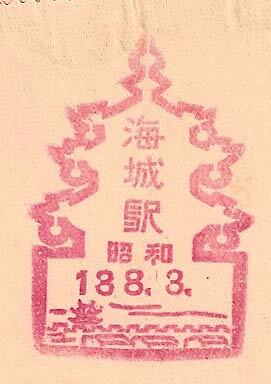 Known colours - Red Brown Railway Cachet - Dated 16th August 1932. This example was issued at 鉃嶺 T'ieh-ling station. The image shows the hilltop Pagoda and and Pavilion at T'ieh-ling. 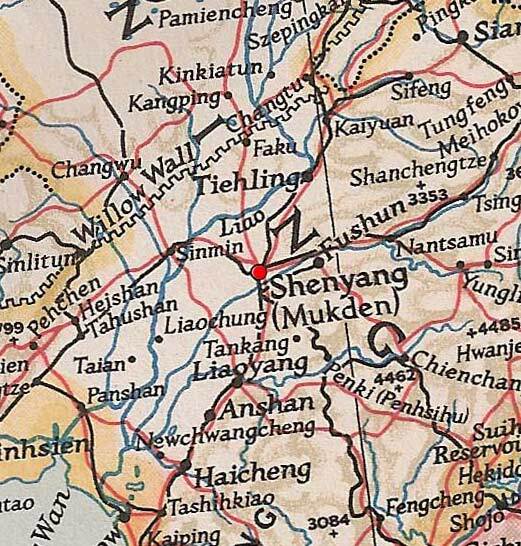 The characters used read Sieh-ling for some reason instead of the more usual 鐵嶺 T'ieh-ling. 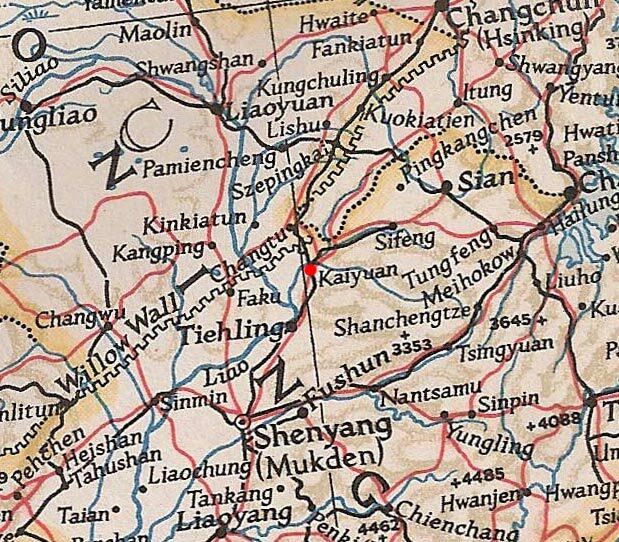 The town is correctly identified by the images which are typical of this location. Size 44mm dia. Known colours - Red and Brown. 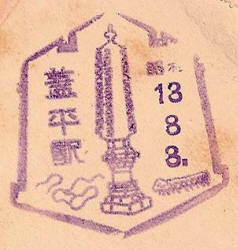 Railway Cachet - Dated 18th September 1932. 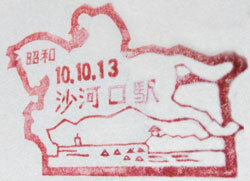 This example was issued at 旅岳熊 Luchiatun (Lǚ yuè xióng) station. The image consists of a hill topped by a monument overlooking the sea. 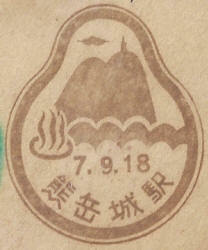 The symbol in the foreground indicates hot springs. Size 36mm x 44mm. 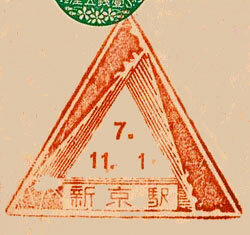 Known colours - Brown Tourist Cachet - Issued 12th April 1932 (Japanese dating). 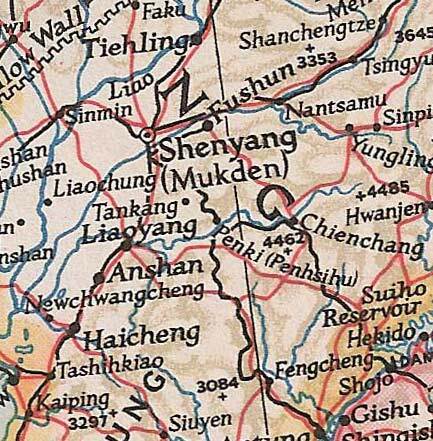 This example was issued at in 奉天 Mukden Station. Design features - Mukden Mausoleum with a Lion Dog statue in the foreground. Size 45mm. Known colours - red/brown. Railway Cachet - Dated 10th December 1931. This example was issued at Chang Chun station. The striking art deco design shows a triangle made up of three trains. 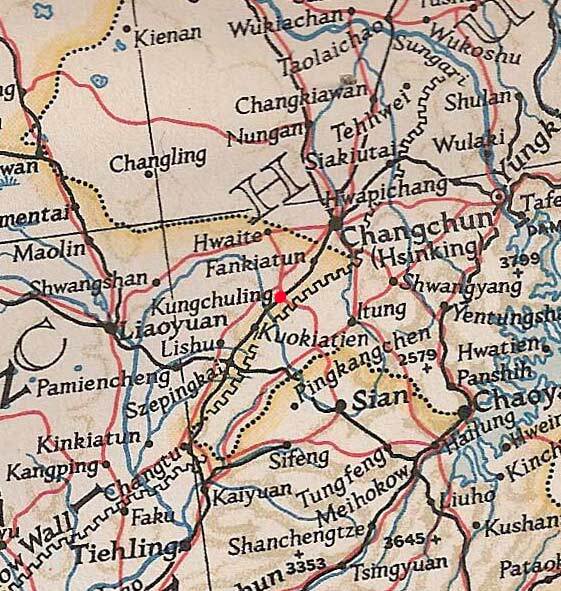 This was later updated when Chang Chun became Hsinking. Size 40mm each side. 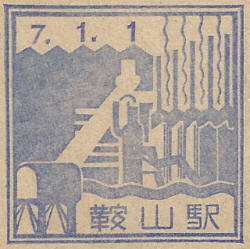 Known colours - Blue Railway Cachet - Dated 1st November 1932. This example was issued at Hsinking station. The striking art deco design shows a triangle made up of three trains. 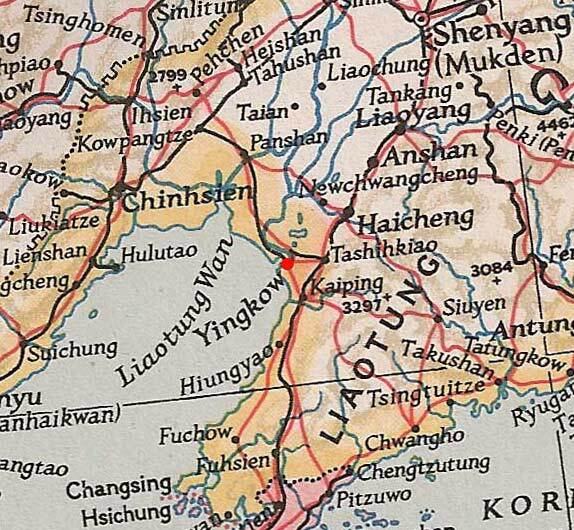 This is the updated version showing the new city name of Hsinking. 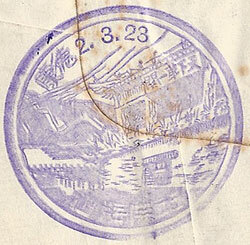 Railway Cachet - Dated 26th March 1933. Design features - Picture shows a horses head and a a boating lake within an outline which sadly I don't recognise - any thoughts? Size 46mm dia. Known colours - brown. Railway Cachet - 29th July 1933. 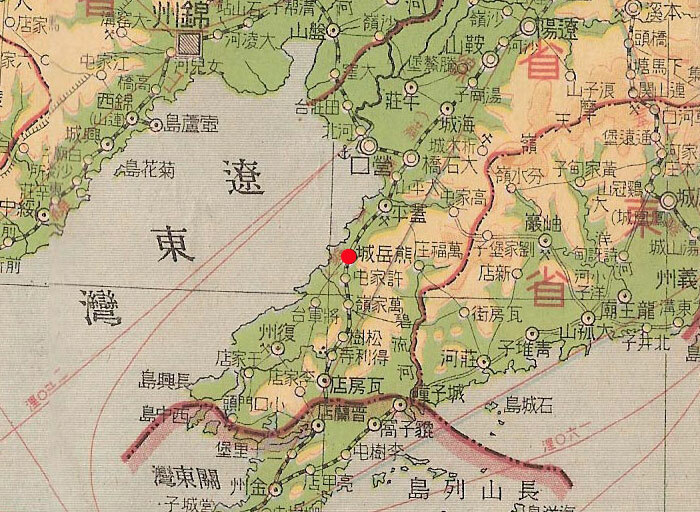 This example was issued at 洮南站 Taonan station. This shows a rural scene with camels and is interesting because it is an early example dated (大同 Datong) 29th July 1933. 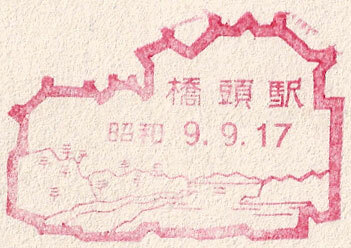 Tourist Cachet - Issued 9th September 1934. This example was issued at 吉 林 站 Kirin Station. Design features - a gate in a town wall and buildings on a hill. Characters read from left to right which is not typical at this time. Size 36mm dia. Known colours - purple Tourist Cashet - Issued 2nd August 1925. 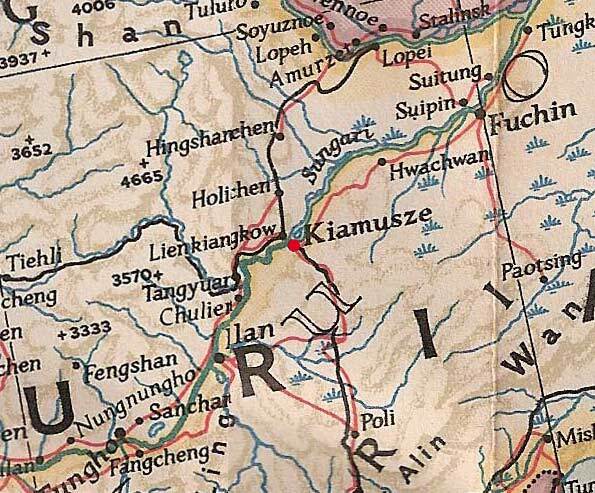 This example was issued in Tsitsihar. Design features - Ships on the river and a view of the town. 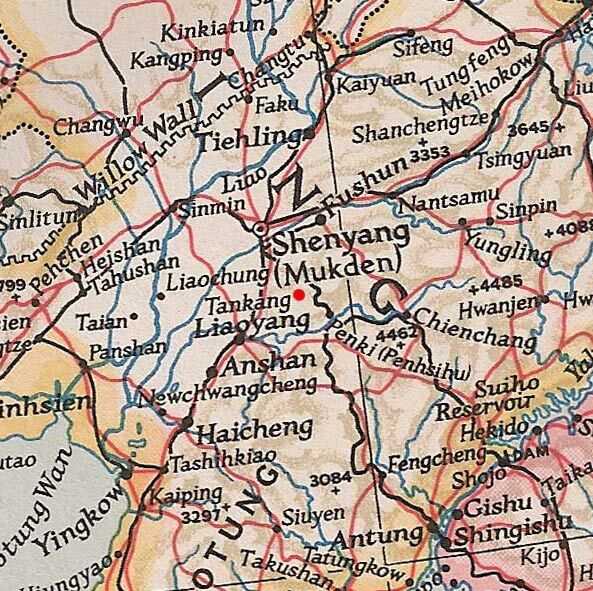 The dating is Manchukuoan (康德 Kangde 1). 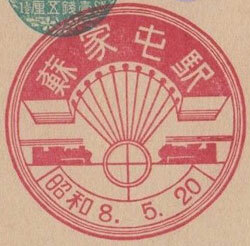 Railway Cachet - Dated 20th May 1933. 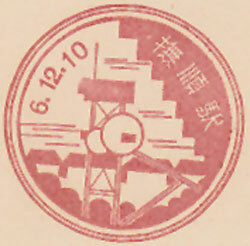 This example was issued at 鳳凰城 Feng-huang-ch'eng station. 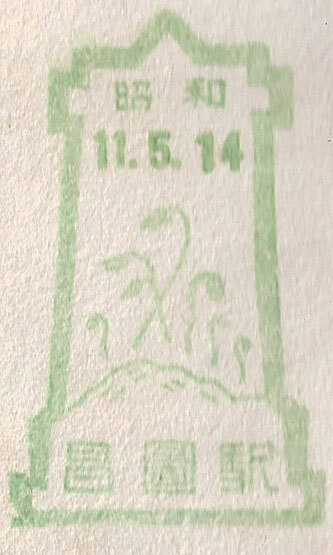 The design shows tobacco leaves and possibly tea bushes. Size 45mm each side. 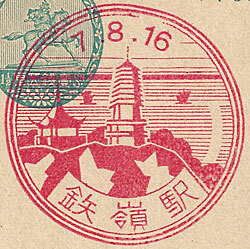 Known colours - Red Tourist Cachet - Issued 6th November 1936. This example was issued at 泰來 TaiLai Station. Design features - The old walled city gate and an ancient monument. This cancel in unusual as most stations had updated to the new shaped cancels by this time. Size 43mm dia. Known colours - red-brown. Tourist Cachet - Issued 1st September 1936. 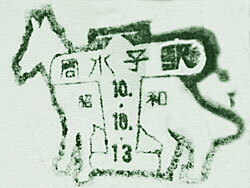 This example was issued in 吉 林 站 Kirin Station. 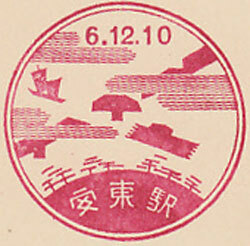 Design features - Ships on the river and a view of a shrine and countryside. 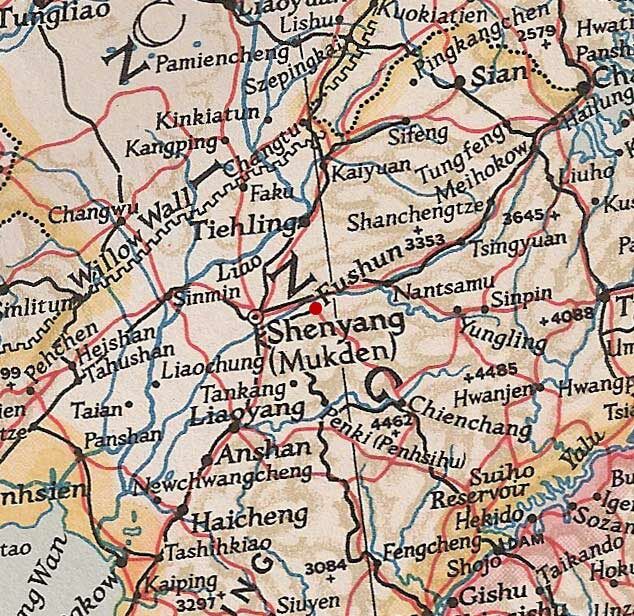 The dating is Manchukuoan (康德 Kangde 3). 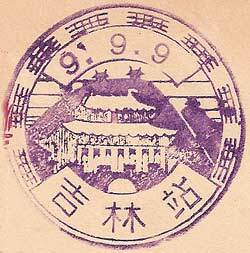 The date 1st September 1936 coincides with the release of the Manchukuoan postal scenic Cachets, this is probably not accidental. Size 45mm. 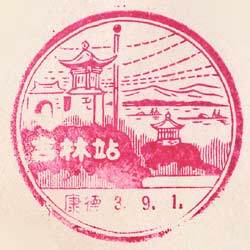 Known colours - magenta Tourist Cachet - Issued 1st January 1932. This example was issued at 鞍山 Anshan Station. Design features - important the refinery and steelworks owned by the SMR. Size 39mm x 39mm. Known colours - blue and red. 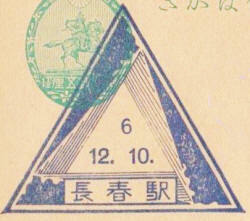 Tourist Cachet - Issued 10th December 1931. 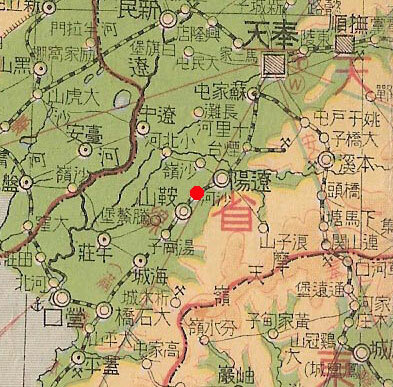 This example was issued in 撫順 Fushun. Design features - Mining equipment.. Size 41mm. 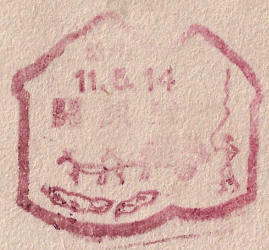 Known colours - dark red Tourist Cachet - Issued 20th April 1932. 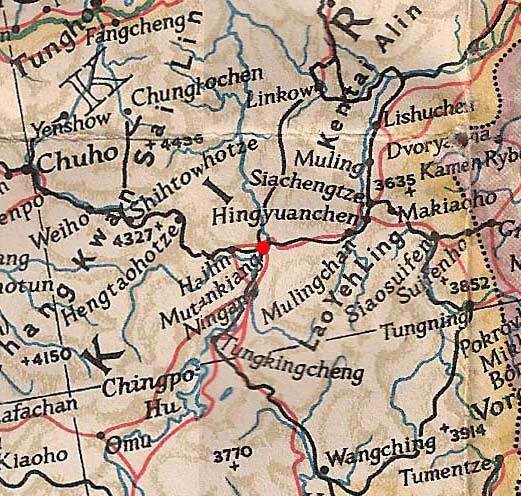 This example was issued in 公主嶺 Kung-chu-ling (SMRZ). Design features - Pig farming and a wind-pump. 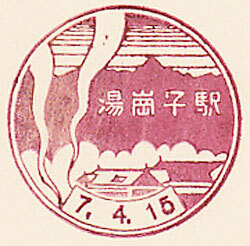 Tourist Cachet - Issued 15th April 1932. 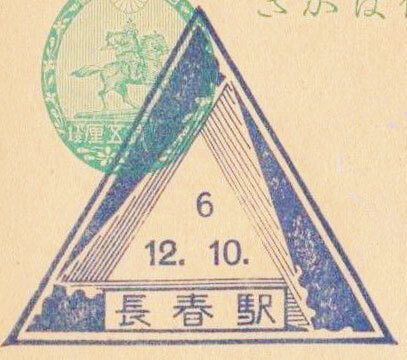 This example was issued in 湯崗子 T’ang-kang-tzu (SMRZ). Size 41mm. Known colours - dark red. 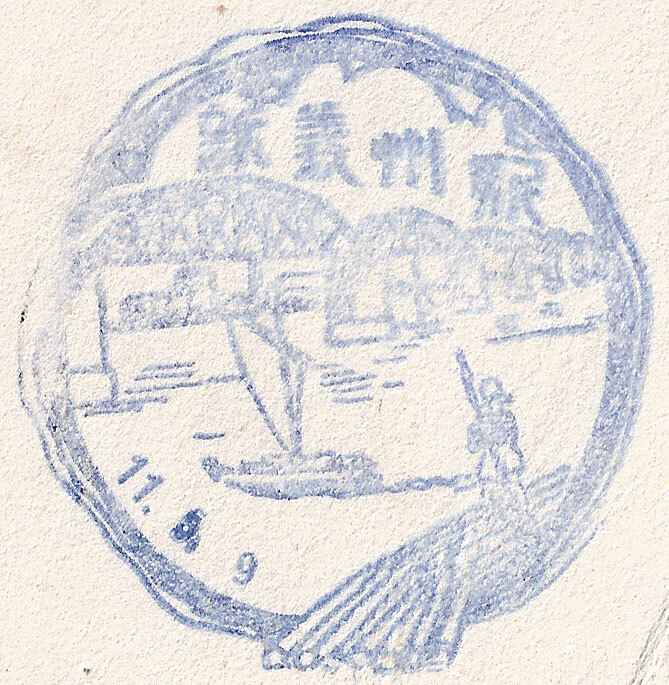 Tourist Cachet - Issued 10th December 1931. 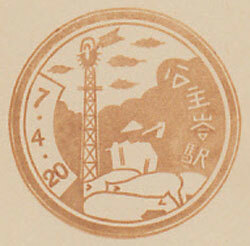 This example was issued in 金州 Chin-chou (SMRZ). Design features - The town walls and pagoda. Size 42mm. Known colours - Blue. Tourist Cachet - Issued 25th December 1931. This example was issued at Dairen Station. 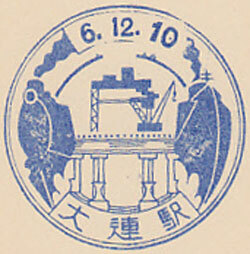 Design features - the port of Dairen with a liner and a train reflecting the fact that Dairen was a major entry port and transport hub. Size 41mm dia. Known colours - Magenta and Blue Tourist Cachet - Issued 7th December 1933 (Note 大同 Datong Year Date). 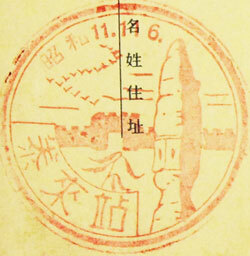 This example was issued in 撫順站 Fushun Station. Design features - A pagoda pagoda with houses in the foreground. 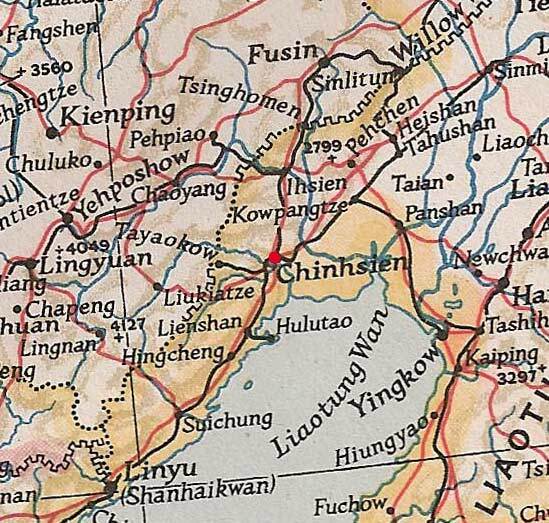 On the skyline are the chimneys perhaps connected to the famous Fushun colliery. 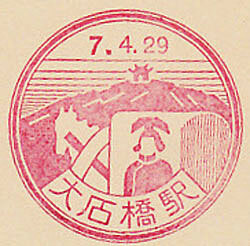 Tourist Cachet - Issued 29th April 1932. 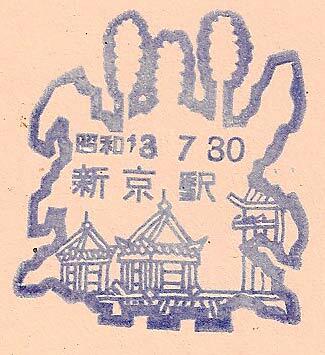 This example was issued at 大石橋 Ta-shih-ch’iao Station. 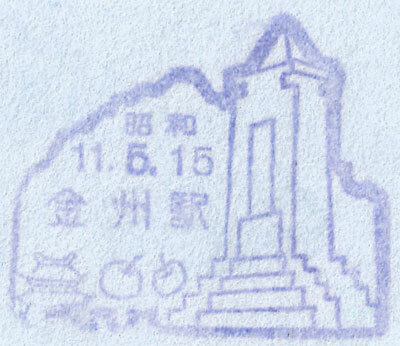 Design features - A hill with a monument/temple plus the image of a person in traditional dress. Size 42mm dia. Known colours - Magenta. 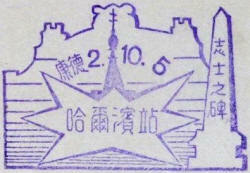 Tourist Cachet - Issued 10th December 1931. This example was issued at 安東 Antung Station. Design features - A view from the air of a junk approaching the swing section of the iror bridge.. Size 44mm dia. Known colours - Magenta. This example was issued at 周水子 Chou-shui-tzu Station (Dairen Airport) KLT. 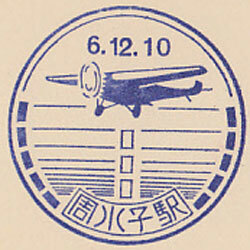 Design features - An aircraft in flight. Size 42mm dia. Known colours - Blue Tourist Cachet - Issued 10th December 1931. This example was issued at 旅順 Lushun (Port Arthur) KLT. 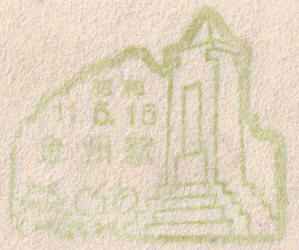 Design features - the Japanese War Memorial on White Jade Hill. 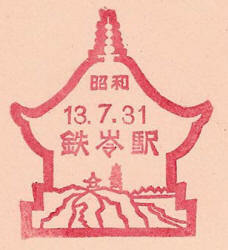 Tourist Cachet - Issued 20th May 1933. 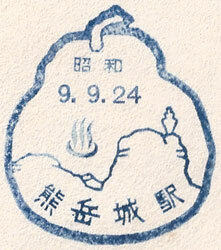 This example was issued at 伊家屯 I-chia-t'un Station. Design features - a turntable, several routes plus two railway engines. Size 46mm dia. 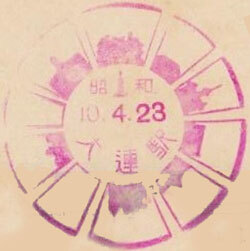 Known colours - Magenta Tourist Cachet - Issued 23th March 1935. 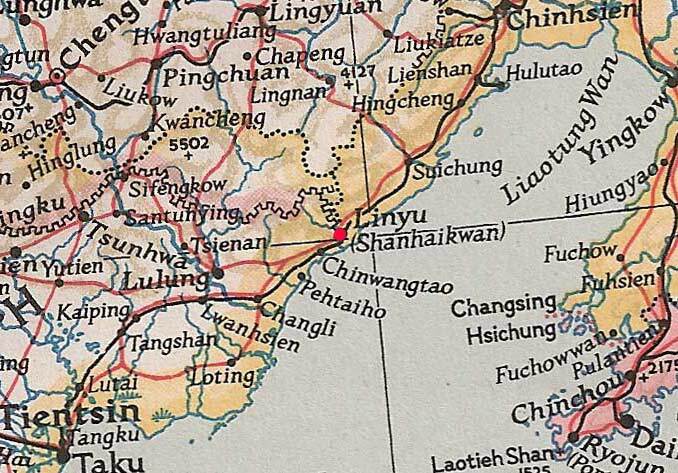 This example was issued at 山海關 Shan-hai-kuan Station. 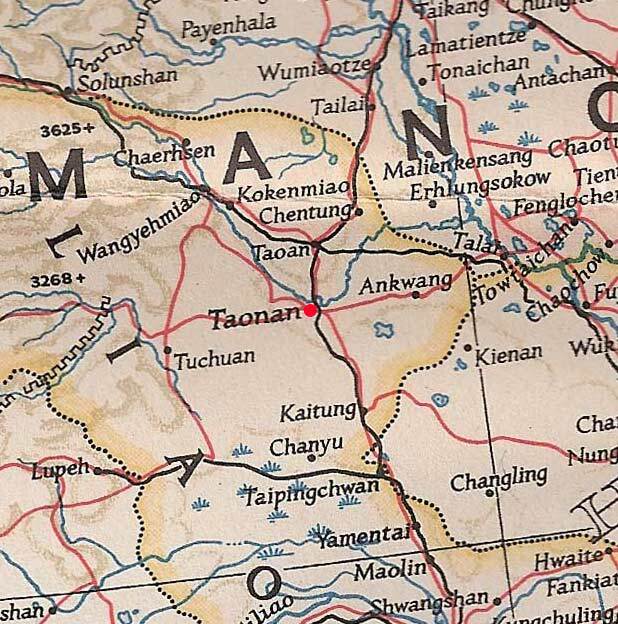 Design features - The famous gate in the great wall that separates Manchuria from North China. See examples on a cover here. 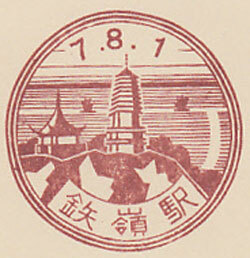 Tourist Cachet - Issued 21st February 1937. 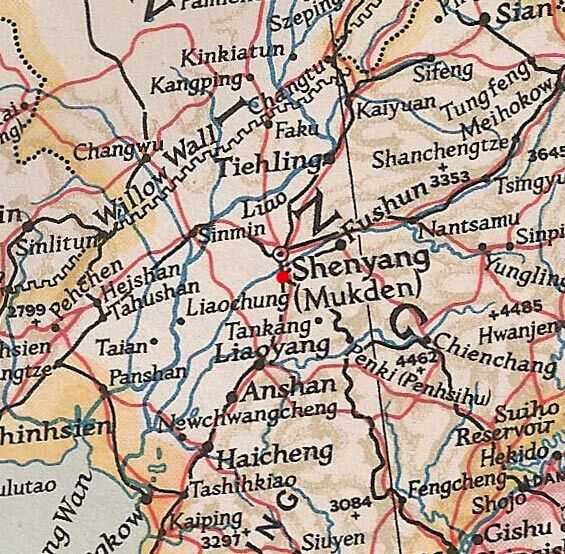 This example was issued at 牡丹江 Mu Tan Kiang Station. Design features - Images of the town and river. Size 46mm dia. 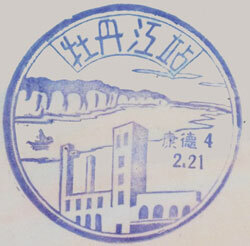 Known colours - Blue Tourist Cachet - Issued 23rd April 1935. This example was issued at 大連 Dairen Station. 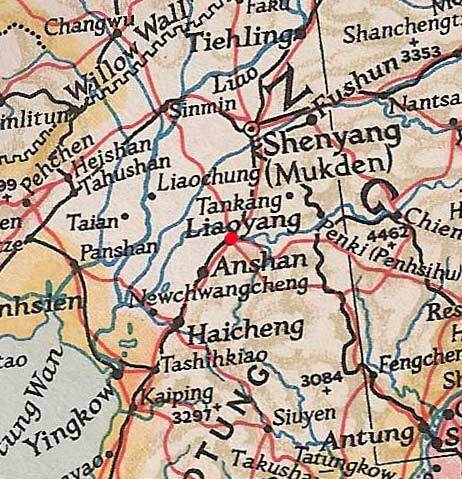 Design features - This shows the outline a number of important buildings in the city. 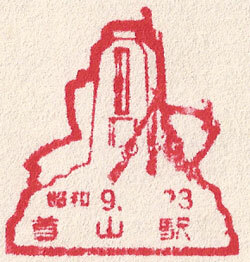 This example was issued at 新義州 New I-Chou station (later re-named I-Hsien). 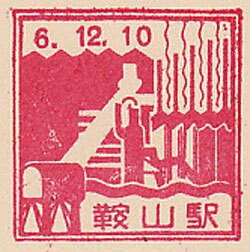 The image depicts an iron railway bridge and rafts of logs. 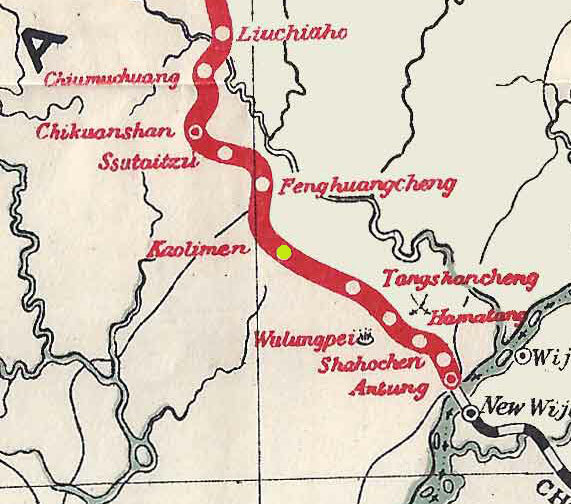 The railway crossed the river at I-Hsien so it is likely that this view was typical of the area. Size 54mm dia. Known colours - Pale Blue Railway Cachet - Dated 14th May 1936. This example was probably issued at 開原 Kai-yuan but is hard to read. Design features - a farmer driving a donkey cart with beans in the foreground within the shape of haystacks. .Design Size 40mm x 32mm . Known colours - red. Railway Cachet - Dated 15th May 1936. 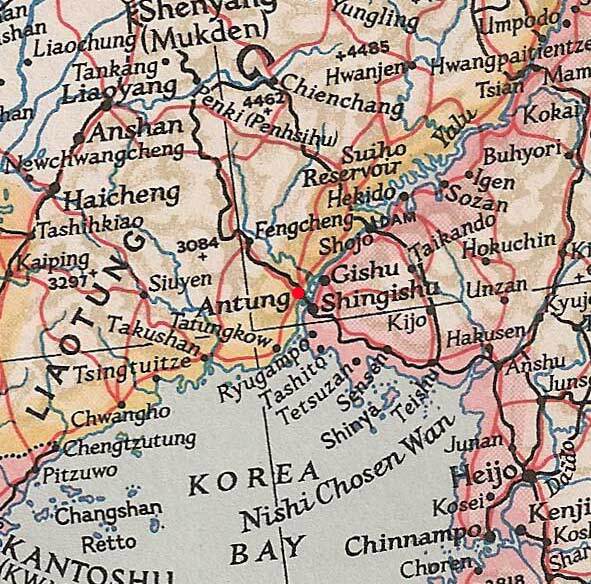 This example was issued at 金州 Chin-Chou station (later re-named Chin-Hsien). Design features - a war memorial with cherries and a building, probably the city gate. An enhanced copy of this image can be seen here. Design Size 40mm x 32mm . Known colours - green and violet. Railway Cachet - Dated 15th September 1942. Design features - Pictures of the city roofline in an outline shape of Hsinking. Size 33.5mm x 42mm . Known colours - purple and magenta. 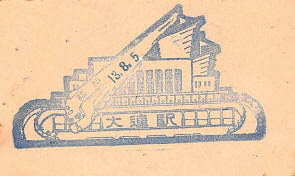 Railway Cachet - Dated 13th October 1935. Design features - The design features a race-horse and an landscape. Size 35mm x 28mm . 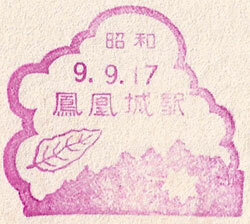 Known colours - magenta Railway Cachet - Dated 13th October 1935. 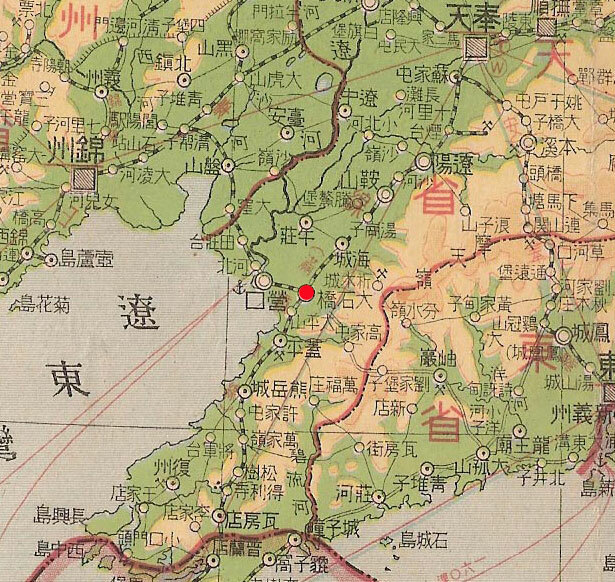 This example was issued at 周水子 Chou-shui-tzu Station in the KLT. Design features - The design features a pack-horse and an aeroplane..
Railway Cachet - Dated 13th August 1938. This example was issued at 蓋平 Kai Ping Station. Design features - a monument and beans and what looks like a centipede?. Design Size 35mm x 37mm . Known colours - purple. Railway Cachet - Dated 19th September 1934. Design features - One of the famous stone elephants from the North Mausoleum. Size 35mm x 33.5mm . Known colours - magenta and purple. 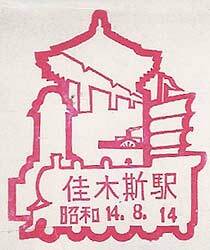 Railway Cachet - Dated 14th August 1939. Design features - Outlines of local landmarks, train, bridge, paddle-steamer and junk. Size 30.5mm x 36mm . Known colours - magenta. Railway Cachet - Dated 14th May 1936. 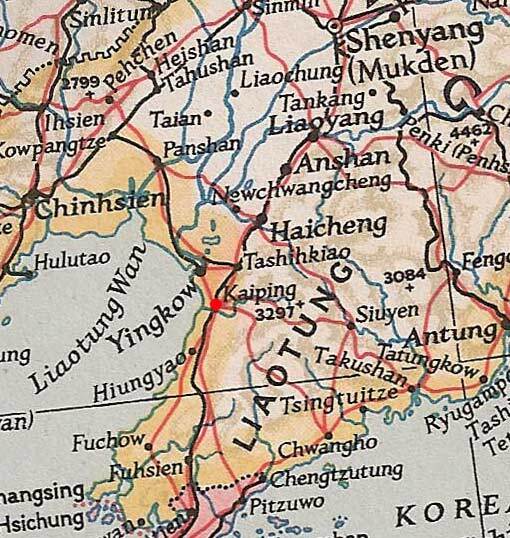 This example was issued a 昌圖 Chang Tu Station. 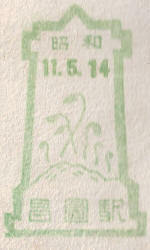 Design features - Plants, probably seedling crops within the shape of a tower. Railway Cachet - Dated 14th September 1939. 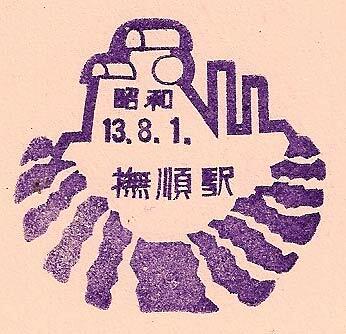 This example was issued at 蘇家屯 Su-chia-t'un Station. Design features - A steam railway engine and a shrine. Size 55mm x 21.8mm . Known colours - grey black. Railway Cachet - Dated 14th September 1939. Design features - A bridge and what I believe to be a hut on a raft of logs being transported on the river. 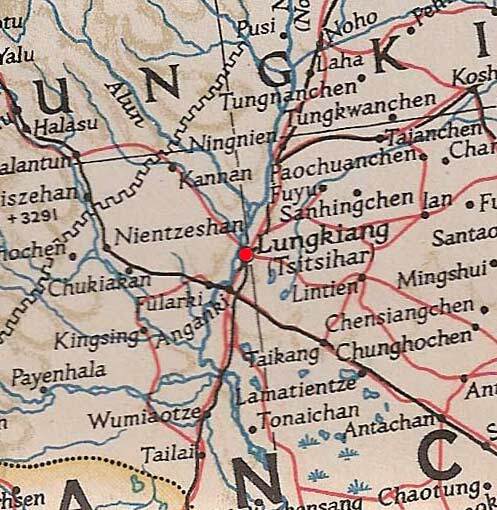 I have seen this on postcards from Antung. Size 60mm x 19.5mm . Known colours - blue. Railway Cachet - Dated 9th April 1939. 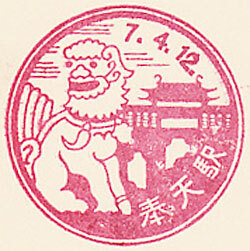 Design features - A lion statue and part of the Great Wall with a rider on a donkey. The station name is also shown in Roman lettering, which is unusual. 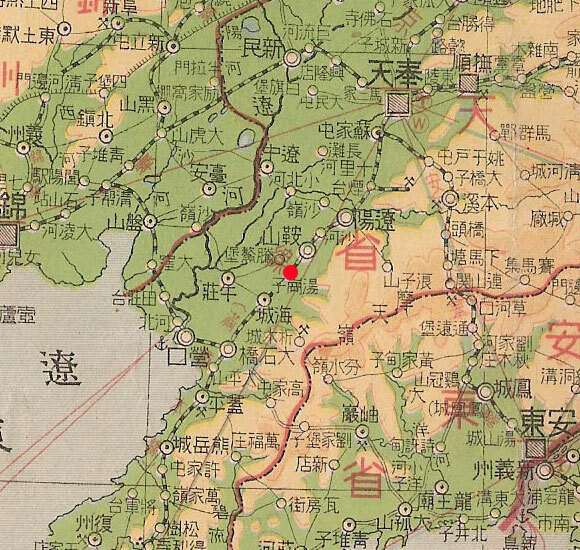 The "First Pass Under Heaven" is a notable tourist attraction, in Chinese this is 天下第一關 and appears in the top panel. It is the place where the Great Wall meets the sea. Design Size 53mm x 55mm . Known colours - red. 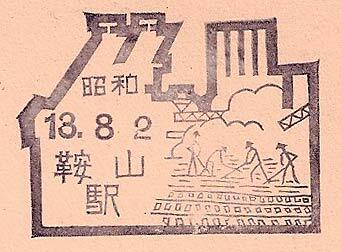 Railway Cachet - Dated 13th August 1938. 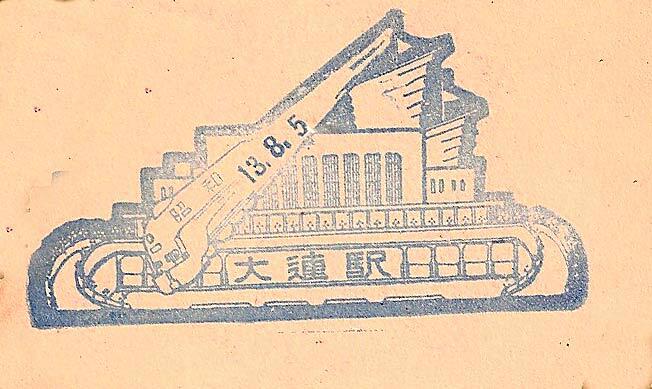 Design features - A train, probably the Asia together with an image of the passenger terminal and a junk. Design Size 72mm x 39mm . Known colours - grey blue. Railway Cachet - Dated 5th August 1938. 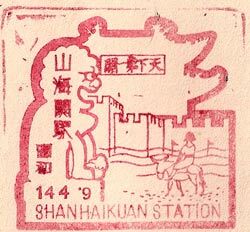 This example was issued at 旅順 Lǚshùn (Port Arthur) Station. Design Size 28mm x 50mm . Known colours - red. Railway Cachet - Dated 3rd August 1938. This example was issued at 海城 Hai Cheng Station. 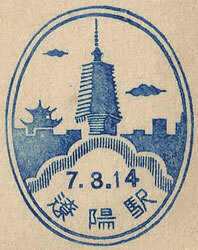 Design features - the outline of a building, no doubt famous in Hai Cheng and a city scene. Design Size 28mm x 41mm . Known colours - red. Railway Cachet - Dated 1st August 1938. This example was issued at 撫順 Fushun Station. 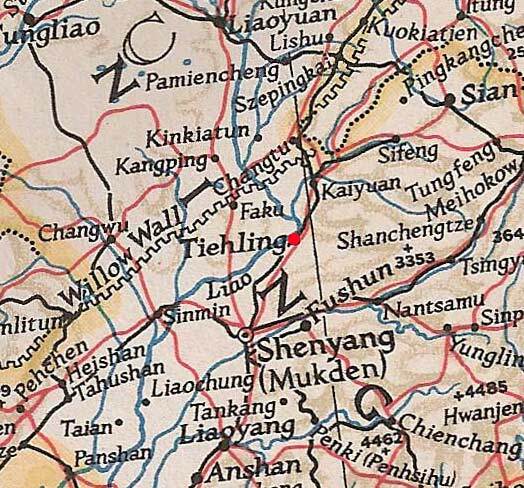 Design features - the Fushun colliery building with the stripes below representing coal deposits. Design Size 39mm x 37mm . Known colours - purple and grey blue. 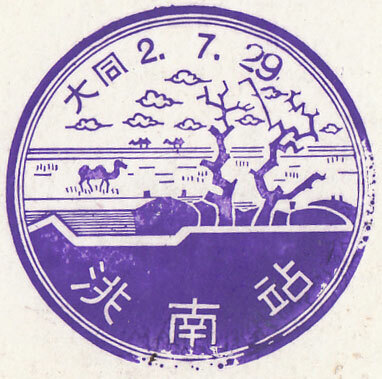 Railway Cachet - Dated 2nd August 1938. 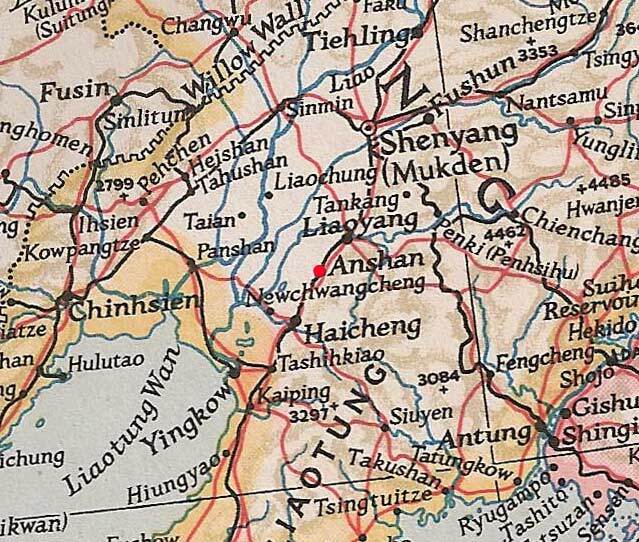 Design features - the Anshan steelworks and railway workers. Design Size 38mm x 28mm . Known colours - grey black. Railway Cachet - Dated 2nd August 1938. This example was issued at 湯崗子 T'ang-k'ang-tzu Station. 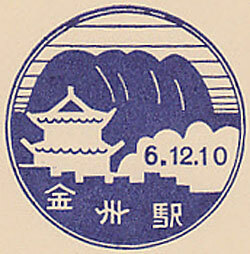 Design features - A rural scene with the hot-springs symbol. 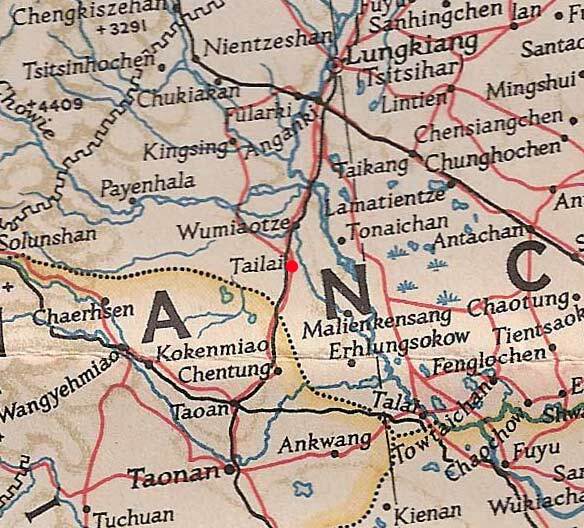 T'ang-k'ang-tzu is close to Anshan. Design Size 50mm x 26mm . Known colours - blue and grey blue. Railway Cachet - Dated 2nd August 1938. This example was issued at 四平街 Szu-p'ing-chieh Station. Design features - a monument and two small camels. Design Size 27mm x 37mm . Known colours - red. 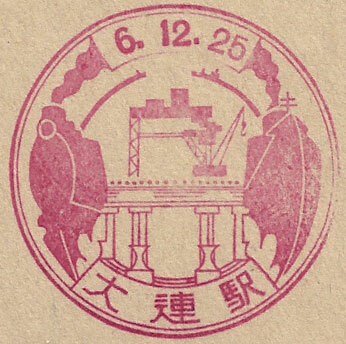 Railway Cachet - Dated 15th September 1942. 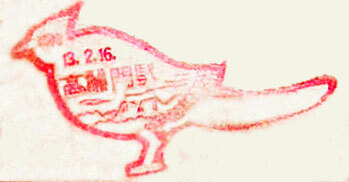 Design features - Pictures of the Kirin in the shape of a bird. Size 48mm x 40mm . Known colours - purple and pale green. Railway Cachet - Dated 28th September 1934. Design Size 28mm x 42mm . Known colours - Green. Railway Cachet. Dated 30th July 1938. 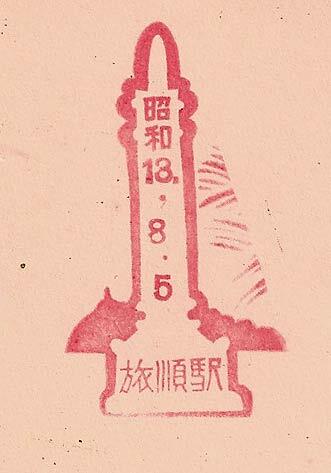 Design features - the outline shape of Kaolin stalks with city buildings in the centre. Design Size 37mm x 42mm . Known colours - purple and green. 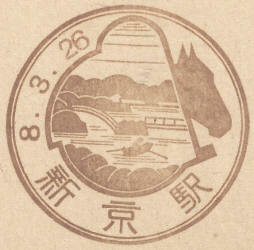 Railway Cachet - Dated 23rd September 1934. 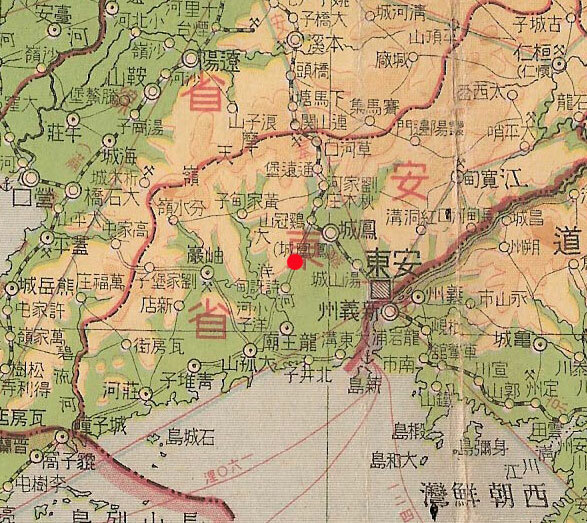 This example was issued at 首山 Shou-shan Station. Design features - the scene seems to depict a memorial with two rifles leaning against it. Design Size 35mm x 36mm . Known colours - red. Railway Cachet - Dated 13th July 1938. This example was issued at 鐵嶺 Tieling Station. 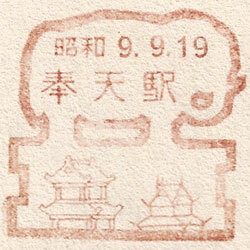 Design features - the outline features the shape of the CiQing Temple enclosing an image of the White Pagoda, Dragon Mountain and the City Wall. Design Size 35mm x 39mm . 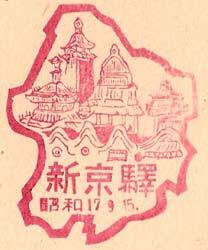 Known colours - red Railway Cachet - Dated 17th September 1934. This example was issued at 橋頭 Ch’iao-t’ou Station. Design features - A picture of a river and countryside within the shape of a traditional building. Railway Cachet - Dated 17th September 1934. This example was issued at 本溪湖 Pen-hsi-hu Station. 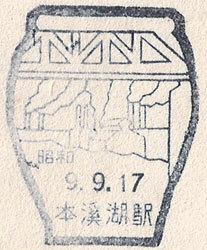 Design features - An industrial scene inside that shape of a pot so presumably a pottery existed at Pen-hsi-hu. Design Size 34mm x 41mm . 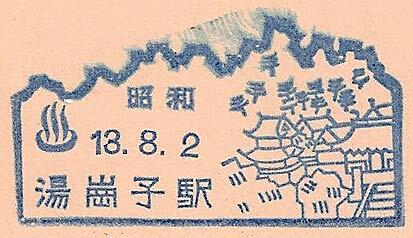 Known colours - Blue Grey Railway Cachet - Dated 17th September 1934. 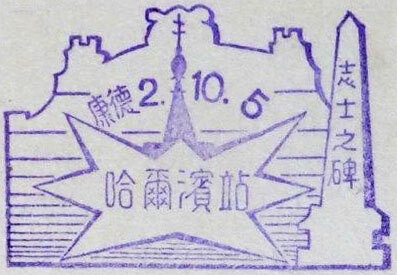 This example was issued at 鳳凰城 Feng-huang-ch’eng Station. Design features - Leaves and forest scenery contained within the shape of a cloud. Railway Cachet - Dated 22nd September 1934. 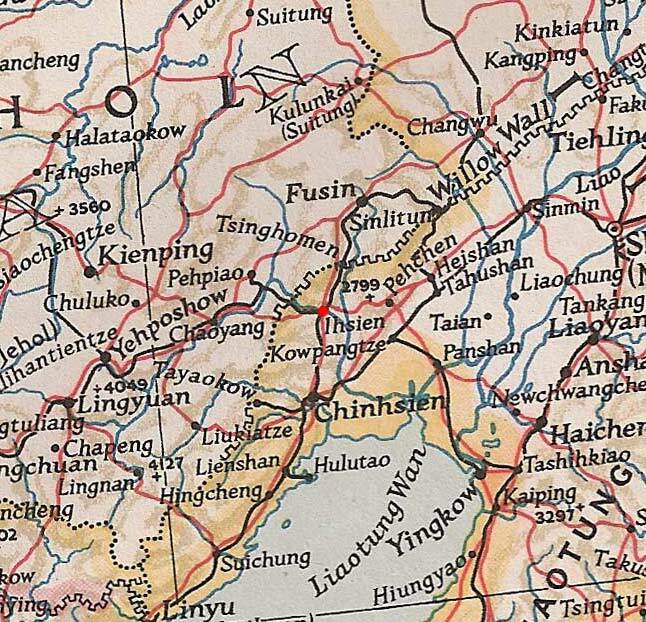 This example was issued at 公主嶺 Kung-chu-ling Station. 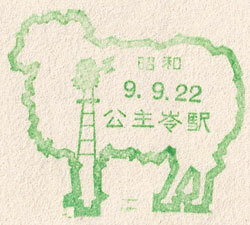 Design features - The outline is of a sheep with inset a wind driven pump. Railway Cachet - Dated 24thth September 1934. 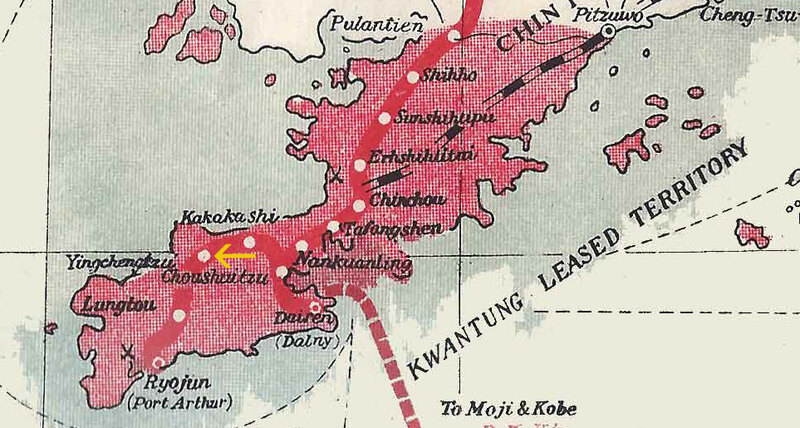 This example was issued at 熊岳城 Hsiung-yüeh-ch’eng Station. 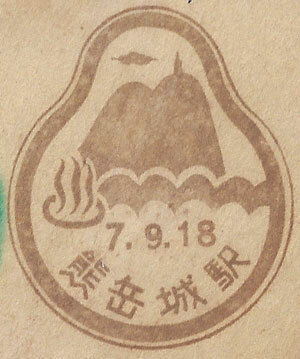 Design features - The outline is that of a fruit, probably a pear within which is the hot springs symbol and a landscape. Railway Cachet - Dated 24th September 1934. 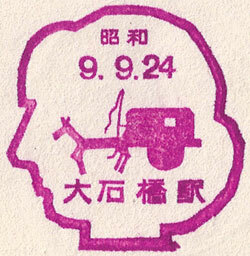 Design features - The outline is of a head containing a carriage. Design Size 40mm x 41.6mm . 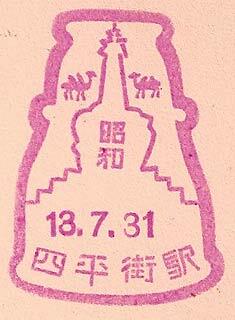 Known colours - Pink Railway Cachet - Dated 5th October 1935. 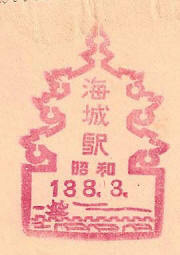 This example was issued at Harbin Station. Design features - The outline is of the station, the Russian Orthodox Cathedral and the memorial standing at the entrance to the station. This example was issued at 高麗門 Kao-li-men Station. Design features - The outline if a parrot like bird in filled with scenery. 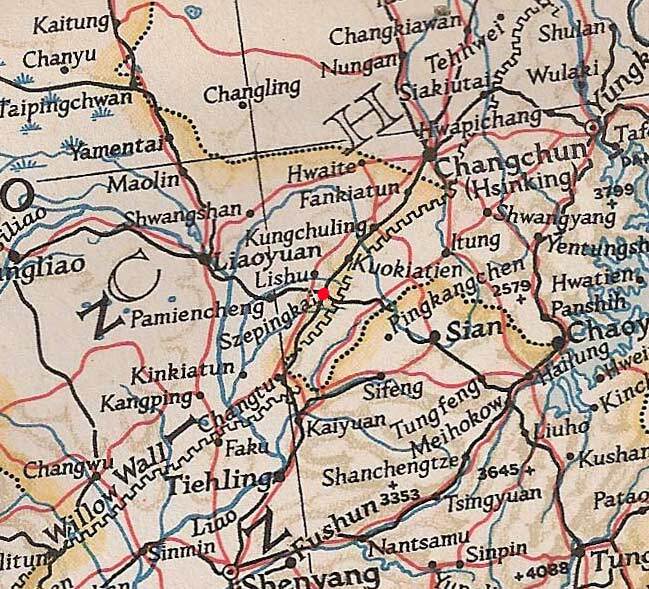 This is a small station near Antung usually only found on railway maps.